Blonde Ambition: FairTrade Finds! GeoBars! Last month Britain made the decision to leave the EU. I won't go into my opinion on the matter, however, one of the many concerns surrounding Brexit is the increase of costs on day to day items such as fruit and vegetables that are imported from other countries that remain inside the EU. With the cost of healthy foods already being an excuse for many not to eat clean my fear is that to save money to cover their increasing shopping bill people will opt out of purchasing Fairtrade products all together. Let me tell you why I think Fairtrade Products such as GEOBars cereal pick me ups should remain top of your shopping list. When you buy any product sporting the FAIRTRADE logo, you are supporting farmers to improve their lives, their communities, you're providing them with protection for their environment, giving them their workers rights, allowing them to invest in further business' to provide work to those in their community. In return they vow to produce in a clean, economic meeting the highest environmental standards. "Fairtrade as a certification is much more than merely an environmental certification, it is the only and best ethical and social certification that really ensures social and environmental, ethical and economic impact, and therefore human impact." - Enrique Calderon - Coffee Farmer, Coopeagri. For over 15 years GEOBAR has been pioneering a global mix of Fairtrade ingredients from around the world. 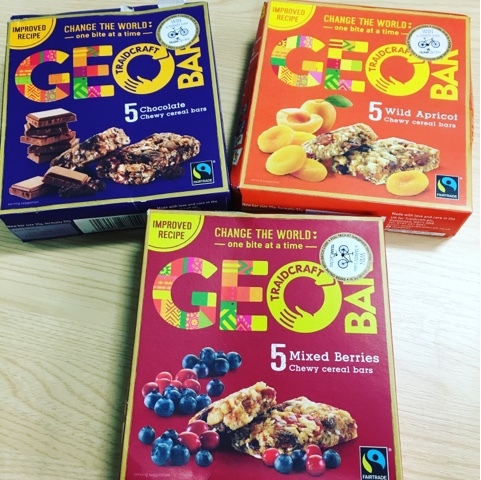 This Fairtrade Fortnight saw GEOBARS hitting the shelves with flavoursome combinations that are now even tastier, responding to customer feedback that they should be less sweet and a source of fibre. As part of its pioneering work in Myanmar, GEOBAR is also set to benefit from a Traidcraft ‘world first’ which will see the first Fairtrade Marked exports of the country’s rice. Traidcraft is working with farmers to support their business through improved farming practices and training, which will make them better equipped for the future and ultimately lead to the rice being used in Fairtrade products including the GEOBAR range. The packs themselves have a vibrant, refreshed look and feel, and the new range includes chewy cereal bars in wild apricot, mixed berries and chocolate flavours. For the 46% of people who snack between meals GEOBAR provides the perfect energy boost at any time of day!